Last update February 2019: 40 new cars added. Take a look in the Monte Special section for engine and body modifications. Please email the details of the Montes you know and are not yet in the serial number (VIN) list! #730 Scorpion at the Pininfarina Factory in Turin. After a first prototype in 1970 (X 1/8) the design evolved to X 1/20 and was on show with Pininfarina on the 1974 Turin Motorshow. 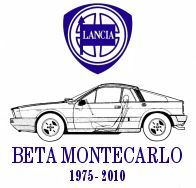 On the Geneva Motorshow in March 1975 the car was launched as Lancia Beta Montecarlo. In 1973-1974 Abarth built two (coupe) prototypes with the Fiat 130 V6 engine; SE029 as comparison to the X1/20 and the SE030 as a race version. The 3481 cc engine was mounted longitudinal and developed 285 bhp. In the 1974 Giro D'Italia (October), the Abarth SE030 with Giorgio Pianta / Christine Becker, no. 527, finished second. The 030 is the forerunner of the Montecarlo, but Fiat regrettably did not keep the V6 for final production because of the oil crisis. 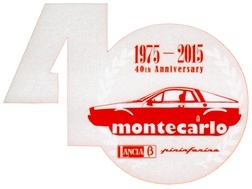 The Lancia Beta Montecarlo is the first car designed and built by Pininfarina. Lancia Montecarlo introduction Geneva Motor Show March 1975. 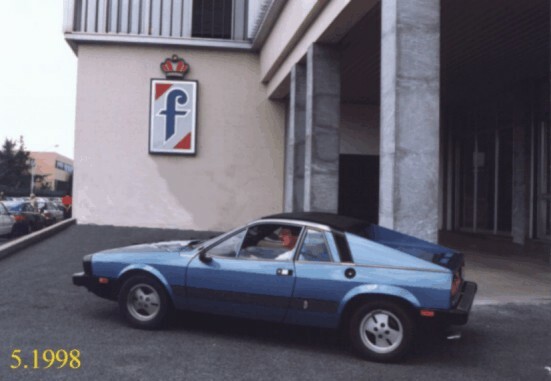 Pininfarina assembly lines started in October 1974 and ended in February 1978. Original table source is unknown; in bold the corrected numbers. It now turns out that the original and widely used production table is NOT correct! For the Scorpions 137AS010001 and 137AS0101805 (now also proved) do still exist and that makes 1805 Scorpions. The first few Scorpion's were manufactured in 11-1975, the only latest produced (now known) Scorpion in 01-1977 is #1789; #1805 is manufactured in 12-1976! Scorpions do have a VIN tag with the manufactured date on it. The majority of the RHD cars were sold in the United Kingdom; 4 coupes are known sold new in New Zealand. For the moment I assume these numbers for RHD cars are correct. Total first production 5635 +3 Group5/Group6 racing body's (+2 Abarth prototypes (SE029-1973, V6 + SE030-1974, V6). The Pininfarina body production review shows a total of 5638 cars built from 1974 (2) to 1978 (55)! The two 1974 spiders were most likely the Pininfarina Turin show cars. For the coupe they built 2080 body's (2 more than Montecarlo's produced) and 3558 spider version body's (1757 Montecarlo spider and 1805 Scorpion as in the table above, so 4 less than stated in the original table as produced). No production numbers for the Group5 Beta Montecarlo Turbo (coupe) body's as well as for prototypes are stated in the Pininfarina body production review. What could have been happened? Last known Montecarlo is #3890 and the first now known is #0055: that's a total of 3836 cars. Last known Scorpion is #1805 and the first known is #0001: that's a total of 1805 cars. In total that makes 5641 cars built; 3 more cars manufactured than body's were made! Another ‘story’ is that delays in completing cars at the end of the Scorpion production and the bad sales position in the US could have been a reason that not all 1805 cars were finished and shipped. However the body's were most probably numbered before painting and assembling and that still leaves a shortage of 4 spider body's! This means there must have been 4 less Montecarlo spiders built than shown in the original table. The 3 Group 5 coupe body's were built in 1978 and most likely taking from the standard car body production or at least counted. The other 8 body’s, + at least 1 spare, for the 1980 and 1981 season were probably built as one batch before 1980 when the second production Montecarlo started and not counted. Two options for the discrepancy: The Pininfarina body production review is wrong (I doubt that) or the production numbers in the original table are wrong. If we assume that the official (sales) production started with car #61 then the total of Montecarlo's is 3830 cars + 1805 Scorpions + 3 Group5 body's makes 5638 body's. The first 60 cars were prototypes and pre-production test cars and car #0055 (pre-production) was later sold. I think this assumption is valid as it is common practice with car manufacturers to only count cars for general sale and of course the original numbers in the table don’t count up. An official start with a #**1 is also more likely. Anyway, time will tell when more data comes available. Introduction Geneva Motor Show March 1980. Production started again in January 1980 and ended in September 1981. Again, the majority of the RHD cars were sold in the United Kingdom; 6 coupes are known sold new in New Zealand. Furthermore at least 32 RHD cars (of which at least 13 spiders) were built in South Africa from 'knocked down' kits. This could well be 50-90 cars! The Pininfarina production review also shows a total of 1940 cars built from 1980 (1108) to 1981 (832). The first real prototype was built, from July 1980, with Dallara from the basics of a Group 5 Montecarlo (a spare body); hence the metal roof of the coupe version! For previous pre-production and development work leftover Montecarlo or Scorpion body's were used. The Pininfarina production review shows only a total of 220 cars (Corse body's) built from 1981 (11) to 1982 (209). Homologated 01 April 1982 for Group B. Total production should have been 265 from 1980-1983, however Lancia also used cars from pre-production, the first batch and re-numbered cars for the later EVO's. So in effect only 220 cars were ever made. Last factory rally participation for the 037 was the 1986 Safari Rally. 1979 Built: 1001 - 1003 works cars; Matt Black with White or Red flamed striping. World Champion of Makes Group 5 under 2000 cc. 1001: Fruit of the Loom (Destroyed at Norisring) and 1008 (July) for German GS-Team. 1981 Built: 1009 - 1011 works cars: 1007 - 1009 - 1011 + 1010 spare car: FIA World Endurance Championship of Makes. Martini colours. World Champion Group 5 under 2000 cc. 1008: (Arcus Air)+ 1010? (Fruit of the Loom), German GS Tuning Team in German Group 5 division II under 2000 cc and some World Championship races. 1982 1005+1009 for Daniele Audetto, Vesuvio Racing, Scuderia Sivami di Galliote: 13 starts. According to WOW 'La Lancia' there were 11 cars built and later sold to privateers with 25 engines for the 1982 season.